This option exports your TradeLog Form 8949 data to a TXF (*.txf) file which will allow you to import into TurboTax® and many popular tax software programs that accept the TXF file format. A popup dialog box will allow you to provide a name for this file and save it to the "my_documents\tradelog\reports" folder on your hard drive, so you can easily find it later when importing into your tax program. Warning: TurboTax® online versions do NOT allow you to import TXF data. Desktop versions limit importing records for Form 8949 to 2,000 - 2,500 records. If you exceed this limit or are using the online version, see the instructions for e-filing using Form 8453 method. 1. After generating Form 8949 in TradeLog, click on the TurboTax® button on the report toolbar at the top of the window. 2. A dialog box will open, type a File name and confirm the location the file is being saved, then click Save. Note: By default TradeLog saves the export files in the MyDocuments/TradeLog/Reports folder. 3. A pop-up box will confirm the export was successful. Click OK to continue. 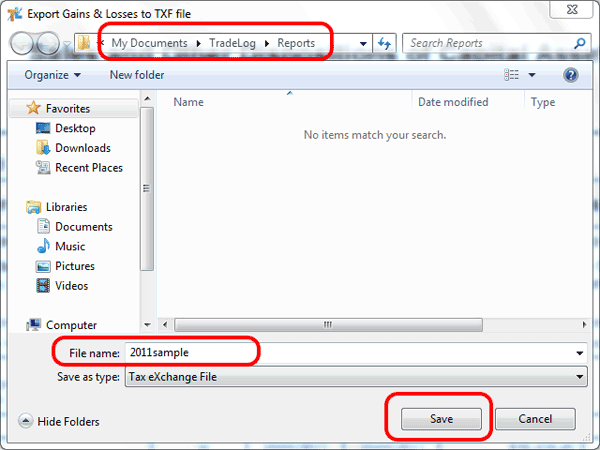 You can now use this TXF file with your tax software.